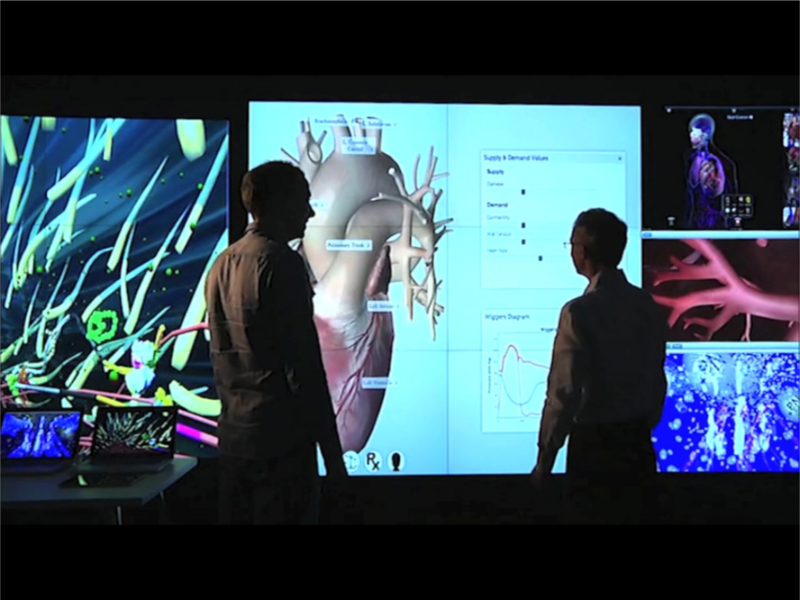 Interactive Physiology in 4D. Multiscale Modeling in Space (3D) and over Time (1D). LINDSAY Composer (LComposer) is an agent-based simulation environment with built-in physics and high-end graphics for rendering in real time. 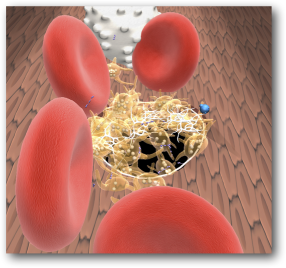 Simulations are scalable from the body level to the level of systems, organs, tissues, cells, and sub-cellular structures. Ph.D. student Timothy Davison and Dr. Christian Jacob working with LINDSAY Composer applications on a high-resolution display wall in the Visualization Studio at the Digital Library, University of Calgary. 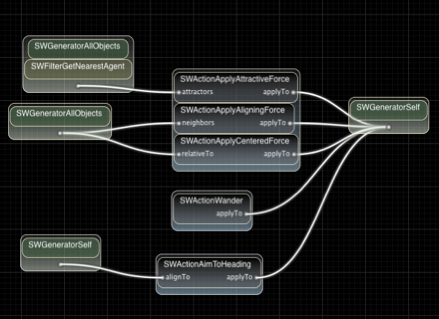 Building a simulation in LINDSAY Composer is done via a drag and drop interface. Users can drag components from a library of component types into the simulation view, where they will appear immediately if they have a graphical representation. Figure 11 shows a typical screen display during the modeling process of a simulation. The LINDSAY Virtual Human team is working to integrate the Microsoft Kinect, a motion-sensing input device for the Xbox 360 gaming console, into LINDSAY Composer. By doing so, the team hopes to create a “natural user interface,” which will allow the software to be controlled solely through body gestures. 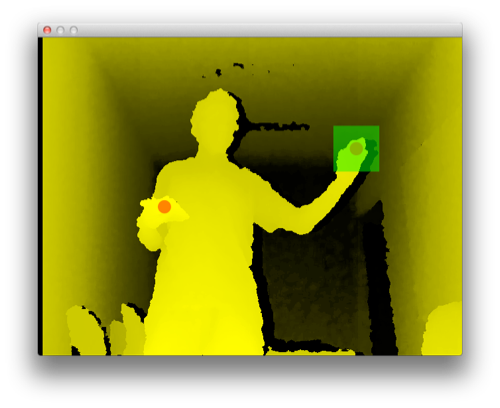 The Kinect generates depth sensor and skeletal positioning data, which in turn allows Composer to be controlled entirely through the user’s gestures, without need for a separate input device. For example, the user’s perspective is adjusted based on his head movements — if he leans his head to the left, his perspective on the simulation world shifts in a corresponding manner; other interactions allow for control of objects within the simulation, such as one in which the user moves objects around inside the simulation world by closing his hand over the object and dragging it around. 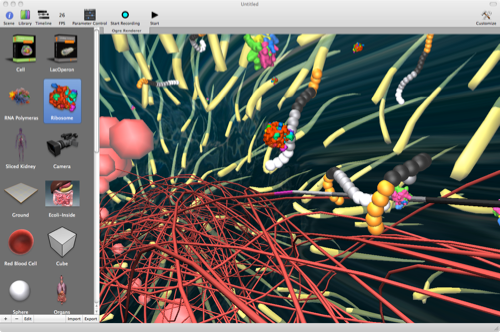 Similar to first-person 3D computer games, the LINDSAY Composer creates an environment that immerses the user into a virtual 3-dimensional world, with the context of anatomical structures and processes. Different from prerecorded contents, the underlying computational engines in combination with the dynamic scene composition allow for interactive explorations that are guided by the user’s intuition and curiosity. Software engineering methodologies, hardware advancements and agent-based models turn simulations into a highly interactive multimedia experience. While LINDSAY Presenter supports visualization and exploration of static contents on human anatomical structures, it becomes more challenging to integrate human physiological processes into an anatomy model. The challenge mainly arises as highly dynamic processes, resulting from a network of interacting components, have to be illustrated over time and within 3-dimensional space. We also did not want to resort to mere animations of such contents, as this would not allow for a wide range of interactive exploration of the underlying networked units and their interactions. Furthermore, we want users of LINDSAY to be able to navigate to any part of the virtual human body and, even more importantly, be able to quickly zoom to physiological processes at (almost) any scale. More precisely, a user is able to experience human anatomy on the whole-body level, on the level of organs, tissues, and cells, down to sub-cellular components. This requires an integration of mathematical and computational models of the various processes across multiple scales in space and time. LINDSAY Composer is our first prototype of such a multi-scale programming, composition, and visualization toolset to explore and present physiological processes within a virtual 3D female and male anatomy model.